Linen Backing: Frequently Asked Questions: Should I Linen Back my Poster or Not? Posted on Mar 15th, 2016 | Comments Off on Linen Backing: Frequently Asked Questions: Should I Linen Back my Poster or Not? Should I Linen Back my Poster or Not? We get this question a lot by our customers and we always ask them what they are buying the posters for; to hang and display them or to file them away in a collection? Since it’s obvious even to a serious collector that a linen backed poster looks better than a folded one the choice must be based on other factors which we discuss here. There are really four groups of people who buy posters. The largest group are those who intend to display their posters in their house perhaps in their media or game room or in their offices or restaurants. This group also includes interior decorators. The second group of people are collectors of Hollywood memorabilia, who collect everything related to their favorite movie or actor, singer or genre. Others will collect WW1 or WW2 propaganda posters while others focus on Travel, Advertising, Circus or Magic posters. For this group the poster is what matters regardless of whether the poster is backed or not. These collectors are the so called “serious” collectors who prefer posters in their original folded or unfolded condition and in as close to mint condition as possible. Much like collectors of stamps or comics they are willing to pay a premium for fine examples and are always looking to upgrade and expand their collections rather than spend money on conservation. The fourth group of people are those who buy with the intention to sell, they may have little or no emotional attachment to the poster they are in effect dealers who are trying to make money by investing in posters. Condition is everything: is your poster stable? If you have to unfold your poster gingerly because the poster is so brittle that it wants to fall apart and is torn or starting to tear, then your poster is not stable and we recommend linen backing it. Existing flaws and imperfections are likely to worsen over time if left unattended. Posters are made of paper an inherently delicate and highly vulnerable material and almost all are damaged in some way. This is just a manifestation of their age as they were never meant to last forever. If your poster is already damaged linen backing will stabilize the poster and you may choose to have some restoration undertaken to fill holes, repair margins and retouch missing color. 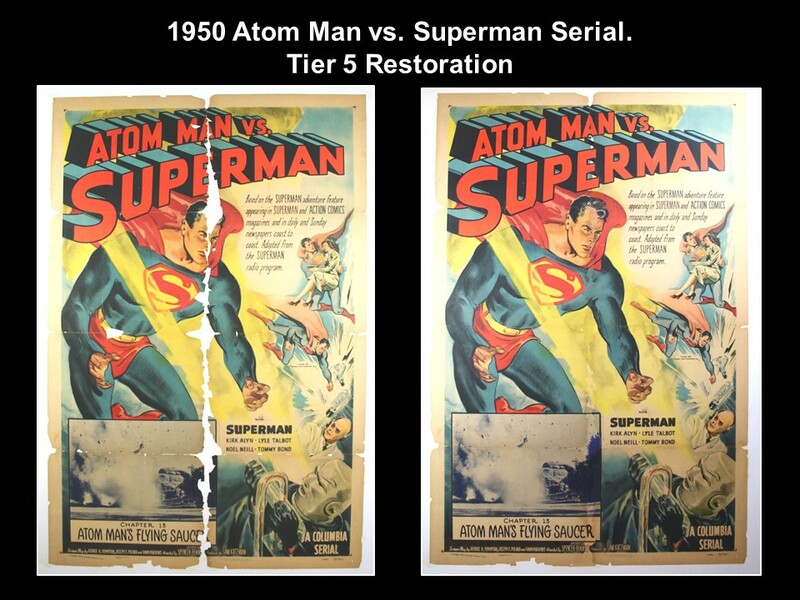 Almost all restoration is performed after the poster is linen backed. Once linen backed your poster will be protected from mishandling; it will not tear or fall apart at the fold lines and it will not disintegrate from oxidation and acids which are so prevalent in older paper. The poster will also be flat after linen backing, a hint of those fold lines will still be present but they will not spoil the appearance of the design and artwork. The fold lines were never what the artist had in mind when he designed the poster! Is your poster in very fine or mint condition? If your poster is in near mint condition, then we would suggest not linen backing the poster if your intent is to resell it or use it as an investment. Your poster will appeal to all 4 groups of collectors which translates into more value. Let someone else make the decision to linen back and save yourself the cost! Will Linen Backing Improve the Value of my Poster? Linen Backed posters will usually sell for more in auctions, scanning auction archives and sorting results from high to low will almost always reveal this fact. Linen Backing, if done correctly, is an archival process meaning that it is reversible. If the poster were to ever get damaged a conservator would be able to remove the poster from the backing and remount it relatively easily. People recognize the additional value of a well linen backed poster. A poster which is poor, fair or even good condition has limited value. If the poster cannot even be safely handled, then it’s really just a piece of vintage paper. A good conservator who can rescue such a poster from oblivion greatly enhances it’s potential value. Will the Cost of Linen Backing be recovered if I sell my poster? This will depend on how much you spend to get your poster backed. 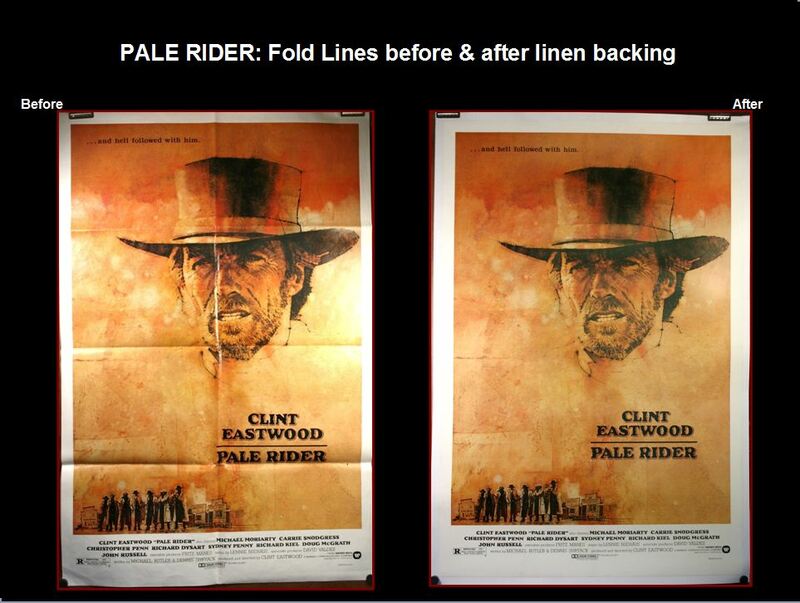 Beware of dealers and retailers who do not linen back posters themselves as they will contract the work to a linen backing studio and take their cut in the process. Such dealers may charge $300 or more to back a US 1 Sheet and you will be lucky to ever recover this premium when it comes time to sell. We linen back all our own material keeping the cost down for our customers. If you spend between $75 and $150 on linen backing a US 1 sheet poster, then you will likely recover these costs if you sell the poster in the future. Is my poster an original if its linen backed? There is a myth that a linen backed poster is no longer an original or is in some way harder to authenticate. Most of the criteria such as fold lines paper quality and National Screen Service (NSS) markings and size are still visible from the front of the poster and even the ink stamp on the back of the poster can be seen under a strong light table. Remember linen backing must be reversible or archival in nature and should not permanently change the poster; we live by the adage that “Less is More” these posters are old, used and well-handled and like any antique or collectible you should never alter the poster so as to lose the “patina” or “soul” of the poster. Many of our WW1 posters have ragged margins which we prefer to leave alone; after all its over 100 years old! Posters should not look new once backed that would be over restoring and you might as well save some money and just buy a reprint! Do you plan on displaying your poster in a frame? One of the key reasons to linen back a poster is to flatten it. Once flattened it will display nicely in a frame. 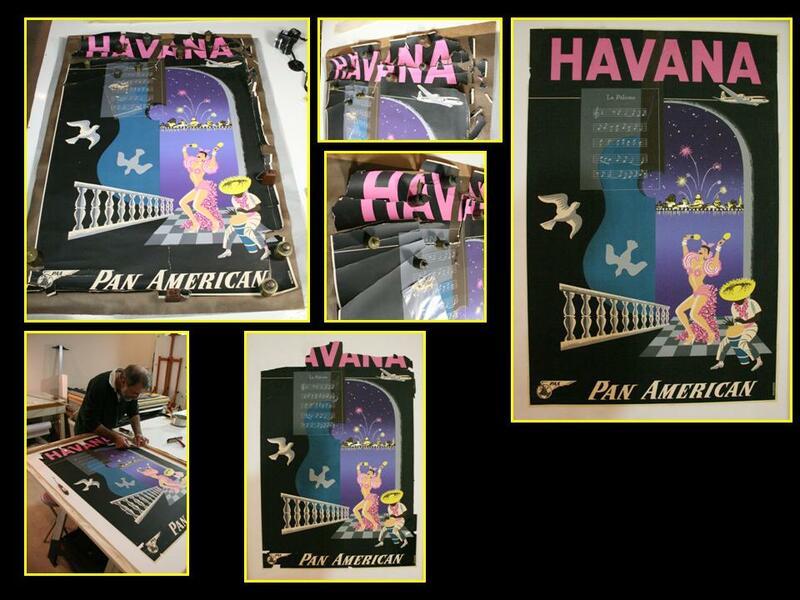 Frame shops achieve the same result by mounting the poster on foam board using permanent, solvent based glues. Among poster collectors this is universally understood to destroy the value and collectibility of a poster. This is because it is so difficult to remove it from the board without damaging it and because the process is very time consuming. Unless the poster is valuable it may not even be worth trying to remove it. From the mid 90’s many posters were printed double sided for use in back lit marquees for added graphic appeal. These glossy posters are more difficult to linen back as the surface of the paper is treated. If the posters are absolutely mint then they can successfully be framed without linen backing, however, if the posters have been handled a lot every wrinkle and wave on the poster will be noticeable and linen backing should be undertaken to flatten the poster.